Once upon a time lived the Gibbon Brothers; George, Gus and Gilbert. They had their own Puppet Show production and were currently on tour with their AMAZING puppet show! 2. They secured the area; built fences around their Marionettes and even installed hidden cameras in the tree tops. Animals from all over lined up to see their production! 3. All the animals filed in and found their seats. Some of the animal kingdom’s top talent scouts were there! The show began with George Gibbon’s puppet singing his opening song. 4. Gus and Gilbert’s bird puppets came out next. They were the comedians of the show and had the crowd falling off their seats in laughter all the way to intermission! 1. At intermission, the Gibbon brothers took a break to eat. However, somehow they ended up stepping into a booby-trap! OH NO! How would they finish the show now? 3. After hours of struggling, Gus, the smallest Gibbon was able to squeeze out and free his brothers at last. They gobbled up some bananas and quickly ran back to their show. 4. Surely no one would be there by now, they thought BUT to their surprise everyone was clapping and cheering, almost as if they’d seen the rest of the show already. But how? 1. Something strange had happened. There were food scraps everywhere and someone or someTHING had finished their show without them. They decided to check the security footage. 2. The Gibbon brothers, were shocked by what they saw! ALL of their Marionette puppets had come to life and finished the rest of their show BY THEMSELVES! This was INCREDIBLE! 3. Real-life puppets would surely make them RICH! They ran backstage to collect the puppets BUT they were GONE! The only trace of them was a trail of peculiar gifts. 4. 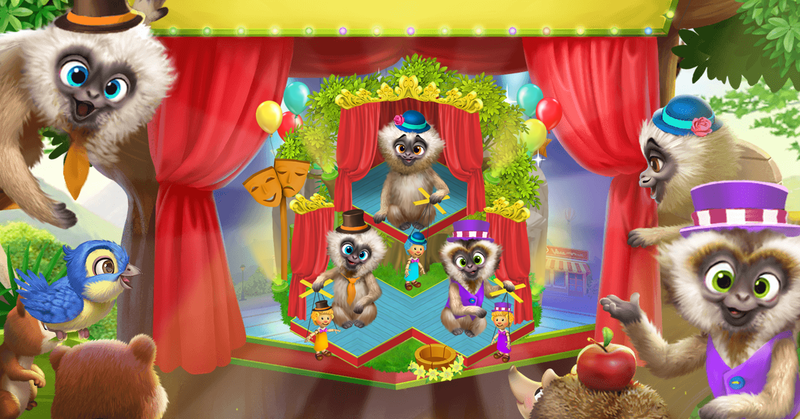 The Gibbon Brothers are STILL searching for their beloved puppets. If you find them farmer, be sure to tell us. In the mean time, check out their new show called; A Puppet Life! Page generation time 0.0291 sek.